"Notus" redirects here. For the United States town, see Notus, Idaho. The earliest attestation of the word in Greek and of the worship of the Winds by the Greeks, are perhaps the Mycenaean Greek word-forms 𐀀𐀚𐀗𐀂𐀋𐀩𐀊, a-ne-mo-i-je-re-ja, 𐀀𐀚𐀗𐄀𐀂𐀋𐀩𐀊, a-ne-mo,i-je-re-ja, i.e. "Priestess of the Winds". These words, written in Linear B, are found on the KN Fp 1 and KN Fp 13 tablets. The Anemoi are minor gods and are subject to the god Aeolus. They were sometimes represented as gusts of wind, and at other times were personified as winged men. They were also sometimes depicted as horses kept in the stables of the storm god Aeolus, who provided Odysseus with the Anemoi in the Odyssey. The Spartans were reported to sacrifice a horse to the winds on Mount Taygetus. Astraeus, the astrological deity (sometimes associated with Aeolus), and Eos/Aurora, the goddess of the dawn, were the parents of the Anemoi, according to the Greek poet Hesiod. Of the four chief Anemoi, Boreas (Aquilo in Latin) was the north wind and bringer of cold winter air, Zephyrus (Favonius in Latin) was the west wind and bringer of light spring and early-summer breezes, and Notus (Auster in Latin) was the south wind and bringer of the storms of late summer and autumn; Eurus, the southeast (or according to some, the east) wind, was not associated with any of the three Greek seasons, and is the only one of these four Anemoi not mentioned in Hesiod's Theogony or in the Orphic Hymns. The deities equivalent to the Anemoi in Roman mythology were the Venti (Latin, "winds"). These gods had different names, but were otherwise very similar to their Greek counterparts, borrowing their attributes and being frequently conflated with them. Now I cannot say if this was really why the Persians were caught at anchor by the stormwind, but the Athenians are quite positive that, just as Boreas helped them before, so Boreas was responsible for what happened on this occasion also. And when they went home they built the god a shrine by the River Ilissus. The abduction of Orithyia was popular in Athens before and after the Persian War, and was frequently depicted on vase paintings. In these paintings, Boreas was portrayed as a bearded man in a tunic, with shaggy hair that is sometimes frosted and spiked. The abduction was also dramatized in Aeschylus's lost play Oreithyia. In other accounts, Boreas was the father of Butes (by another woman) and the lover of the nymph Pitys. Boreas was also claimed to have killed one of Apollo's many male lovers Hyacinthus out of jealousy. Boreas presumably killed Hyacinthus by deflecting a discus that Hyacinthus had thrown straight into his head and killed him. Though his death was said to be an accident on Apollo's part many thought that Boreas was the true culprit. et glacialis hiemps aquilonibus asperat undas. For the wind which came directly from the north the Romans sometimes used the name Septentrio. Zephyrus, sometimes known in English as just Zephyr (Ζέφυρος, Zéphyros), in Latin Favonius, is the Greek god of the west wind. The gentlest of the winds, Zephyrus is known as the fructifying wind, the messenger of spring. It was thought that Zephyrus lived in a cave in Thrace. Zephyrus was reported as having several wives in different stories. He was said to be the husband of Iris, goddess of the rainbow. He abducted the goddess Chloris, and gave her the domain of flowers. With Chloris, he fathered Karpos ("Fruit"). He is said to have vied for Chloris's love with his brother Boreas, eventually winning her devotion. Additionally, with yet another sister and lover, the harpy Podarge (also known as Celaeno), Zephyrus was said to be the father of Balius and Xanthus, Achilles' horses. 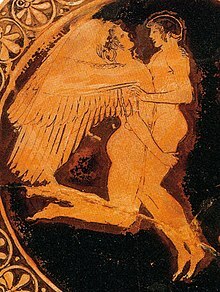 In the story of Cupid and Psyche, Zephyrus served Eros (or Cupid) by transporting Psyche to his abode. will restore to you at the beginning of spring? Notus (Νότος, Nótos) was the Greek god of the south wind. He was associated with the desiccating hot wind of the rise of Sirius after midsummer, was thought to bring the storms of late summer and autumn, and was feared as a destroyer of crops. and drags down forests headlong. to fall asleep carefree with the help of a fire. The name "Australia" (the 'southern land') is derived from Auster. Eurus (Εὖρος, Euros) according to some was the southeast wind, but according to others the east wind. On the Tower of the Winds in Athens, Euros occupies the southeast side, while Apeliotes is in the east. Eurus' Roman counterpart was Vulturnus, according to Pliny the Elder; but for Aulus Gellius Volturnus was the equivalent of the southeast wind Euronotus. Generally in the Latin poets the name Eurus is used for the east or southeast wind, as in Greek. Kaikias was the Greek deity of the northeast wind. He is shown on the monument as a bearded man with a shield full of hailstones. Apeliotes (or Apheliotes) (the name means 'from the (rising) sun') was the Greek deity of the east wind. As this wind was thought to cause a refreshing rain particularly beneficial to farmers, he is often depicted wearing high boots and carrying fruit, draped in a light cloth concealing some flowers or grain. He is clean shaven, with curly hair and a friendly expression. Because Apeliotes was a minor god, he was often syncretized with Eurus, the southeast wind. The Roman counterpart of Apeliotes was Subsolanus. Lips was the Greek deity of the southwest wind, often depicted holding the stern of a ship. His Roman equivalent was Africus, due to the Roman province Africa being to the southwest of Italy. This name is thought to be derived from the name of a North African tribe, the Afri. The Anemoi are occasionally referenced in popular culture. Notably, they make appearances in Percy Jackson & the Olympians and The Heroes of Olympus, two fantasy series by Rick Riordan. In Riordan's first novel, Zephyrus (referred to as "Zephyr") is said to have a role in bringing the demigod children of female Greek gods down to Earth, from Mount Olympus. In The Last Olympian, all four Anemoi and several minor wind gods are involved in the defense of Mount Olympus against Kronos (the Titan Cronus), the first series's chief antagonist. Both the Greek and the Roman forms of the Anemoi appear in Riordan's second series. Boreas is a central character in The Lost Hero, and his children Khione, Calais, and Zetes continue to have important roles throughout the series. He resides in Quebec City, and is described as "sturdily built...with dark purple wings" when in his Greek form, and as "taller and thinner" when Roman. "Notus/Auster appears in The House of Hades as a counselor of sorts to the protagonists. His Roman form is described as laid-back, disinterested in mortal affairs, and stormy; while his Greek form is quick to anger, more in-touch with the human world, and wears a wreath of barley. Favonius/Zephyros also appears in that novel, described as a deeply tanned man with wings the colors of a sunset and holding a basket of unripe fruit. He takes two of the protagonists to meet his master, Cupid, whom he serves as punishment for accidentally killing a man he and Apollo loved during a game of quoits. Eurus was the name of Sherlock Holmes's sister in the BBC adaptation. Red letters interspersed in the credits at the end of the Sherlock episode "The Final Problem" spelled out Anemoi. The California Zephyr, a renowned American cross-country passenger train route, was named after Zephyrus. In the 2014 video game Ryse: Son of Rome, Aquilo is featured as an antagonist to the main character, attempting to bring about the fall of Rome. In the American animated television series, The Venture Bros., Lips, Caecius, and Skiron of the lesser winds are represented by the characters "The Investors", though these characters may be related to their respective Anemoi in name only. The Investors are depicted as a trio of mysterious men in business suits who possess mysterious powers and abilities. Their behavior and appearance is almost demonic in nature, making them a formidable and ominous presence within the series. The fourth Anemos (specifically, Apeliotes the southeast wind) is implied to be the character Dr. Henry Killinger, as he is explained to be the fourth brother of the said trio. Dr. Henry Killinger is removed in appearance and action from his brothers, as he is seemingly depicted as benevolent, while the Investors appear to be generally malevolent in nature. Wikimedia Commons has media related to Anemoi. Wikisource has the text of the 1920 Encyclopedia Americana article Zephyrus. ^ Raymoure, K.A. "a-ne-mo". Linear B Transliterations. Deaditerranean. Dead Languages of the Mediterranean. "KN Fp 1 + 31". "KN 13 Fp(1) (138)". ^ "DĀMOS: Database of Mycenaean at Oslo - Department of Philosophy, Classics, History of Art and Ideas". ^ Pausanias 2.34.2 compared by Festus to the Roman sacrifice of the October Horse, 190 in the edition of Lindsay. ^ a b Aulus Gellius 2.22.12. ^ Liddell, Scott, & Jones Greek Lexicon. ^ a b Lewis and Short, Latin Dictionary. ^ Βορέας, Βορρᾶς. Liddell, Henry George; Scott, Robert; A Greek–English Lexicon at the Perseus Project. ^ Aulus Gellius, 2.22.9; Pliny the Elder N.H. 2.46. ^ Diodorus Siculus, Library, 4.44.2; Apollonius Rhodius, Argonautica 1.211–223, 2.231–239. ^ Βορεάδης in Liddell and Scott. ^ Lewis and Short, s.v. aquilo. ^ Aeneid 3, lines 284–285. ^ Vitruvius 1.6.13; Pliny the Elder 2.51. ^ "Google Image Result for". Google.ca. Retrieved 2013-05-07. ^ e.g. Virgil, Aen. 12.730, Horace, Odes 2.16, Ovid, Met. 15.552. ^ Liddell, Scott & Jones, Greek Lexicon. ^ Aulus Gellius 2.22.1; Pliny the Elder 2.46. ^ Liddell, Scott, & Jones, Greek Lexicon. ^ Lucretius 1.405. Pliny the Elder 2.48. ^ Riordan, Rick (2005). The Lightning Thief. New York, New York: Hyperion Books. ISBN 0-7868-3865-5. ^ Riordan, Rick (2009). The Last Olympian. New York, New York: Hyperion Books. ISBN 1-4231-0147-2. ^ Riordan, Rick (2010). The Lost Hero. New York, New York: Disney-Hyperion. ISBN 978-1-4231-1339-3. ^ Riordan, Rick (2013). The House of Hades. New York, New York: Disney-Hyperion. ISBN 978-1-4231-4672-8.